﻿District Judge Kevin Fine is aware that the US Supreme Court has upheld the constitutionality of the Texas death penalty, but needs to be convinced that the statute can be fair in the case of John Edward Green Jr. This quote reminds me of the “expert” who told NPR recently that the TCCA would likely turn a deaf ear to Tom Delay’s appeal because “the court has a conservative reputation.” (Delay was recently convicted of conspiracy and money-laundering by an Austin, Texas jury.) The ulta-conservative tilt of the state’s highest court is precisely why Tom Delay has a good chance of getting a reversal and why and the hearing in Judge Fine’s court is unlikely to resume. Defense counsel had argued that their client can’t get a fair trial because the prosecution intended to put on the sort of case which led, they claim, to the false conviction and execution of Cameron Todd Willingham and Claude Jones. The TCCA’s decision to grant the prosecution’s motion is the latest attempt by the Texas legal establishment to silence criticism of the death penalty in the wake of the Willingham case. The article below should answer most of your questions. An unusual court hearing on the constitutionality of the death penalty in Texas was put on hold Tuesday after the state’s highest criminal court granted a request by prosecutors to stop it. The Texas Court of Criminal Appeals ordered that the hearing be temporarily halted so prosecutors and defense attorneys can file motions on whether the legal proceeding should be allowed to continue. The hearing, which began Monday and was set to last up to two weeks, had been ordered by a state district judge in Houston. 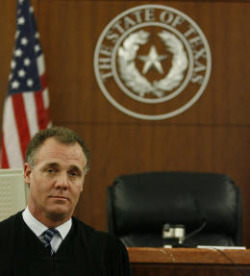 District Judge Kevin Fine last spring initially declared the Texas death penalty statute unconstitutional after granting a motion in a capital murder case he is presiding over. Under heavy criticism, Fine clarified then rescinded his ruling and ordered the hearing, saying he needed to hear evidence on the issue. Fine is a judge in Harris County, which has sent more inmates to the lethal-injection gurney than any other county in the nation. Lawyers for the Houston man who had asked for the hearing had already presented two days of testimony on whether problems with such things as eyewitness identification and evidence offered by informants have created flaws in death penalty prosecutions in Texas and resulted in a risk that innocent people will be executed. They said their client, John Edward Green Jr., is innocent and the case against him uses some of the same faulty evidentiary procedures that have resulted in others being wrongly convicted. Green, who is awaiting trial, faces a possible death sentence if convicted of fatally shooting a Houston woman during a June 2008 robbery. Green’s attorneys said they were disappointed by the appeals court’s decision. Donna Hawkins, a spokesman for the Harris County District Attorney’s Office, declined to comment. At the hearing this week, prosecutors said they wouldn’t participate during the legal proceeding and remained quiet. The appeals court gave both sides 15 days to file their legal briefs. Loper said he doesn’t know how long the hearing could remain on hold. On Monday, the prosecutor’s office had filed a motion with the appeals court, asking it to reconsider its decision from last month to not stop the hearing. In their motion, prosecutors reiterated their arguments that the claims being made by Greens’ attorneys were well-settled case law and that Fine didn’t have the authority to prevent the state from seeking the death penalty in the case. The appeals court is dominated by Republicans and led by a chief judge who was disciplined for closing the court promptly at 5 p.m. while a death row inmate tried unsuccessfully to file an appeal hours before he was executed. Prosecutors unsuccessfully tried to get Fine removed from the case, saying he is biased against the death penalty. Fine has said he believes capital punishment is constitutional and the hearing would focus only on the specific legal issues raised by Green’s attorneys. The hearing had been set to present testimony on Wednesday about the case of Cameron Todd Willingham, whose 2004 execution is under heavy scrutiny. Willingham was executed for a fatal house fire that killed his three daughters. But at least nine fire experts have said the fire was an accident, not arson. Green’s attorneys say Willingham’s case is a prime example of flaws in Texas’ death penalty system. Attorneys with the Innocence Project, a New York legal center that uses DNA to exonerate inmates and worked on the Willingham case, had been set to help Green’s attorneys and question witnesses on Wednesday. If Fine were to rule the state’s death penalty statute is unconstitutional, prosecutors have said they would appeal the decision, which would have a good chance of being overturned, according to legal experts.